I'm gay. My husband is gay. We were born that way. 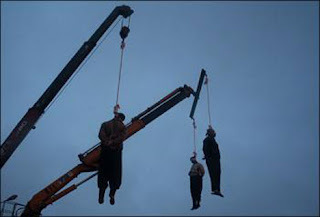 If we were born in Iran, if we lived in Iran, then we could be executed for being gay. I'm just catching up on my news, and The Guardian reported on Wednesday that three Iranian men were executed because they were accused of being gay. According to the article the news source is unsure if it was proven that they were gay. This is terrible news, and the picture is horrible, I know. When I read something like this it makes me both thankful (that I live in the USA) and frustrated (that being gay is an issue, still).